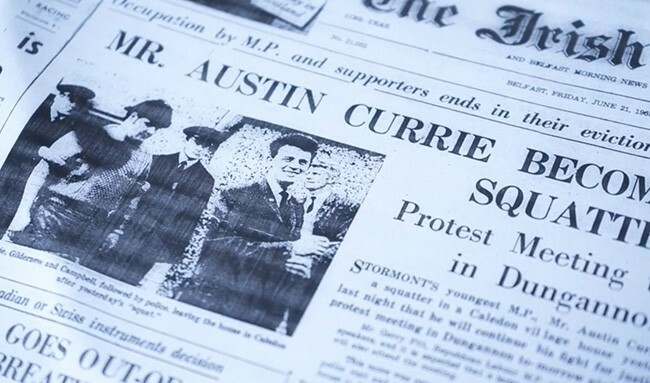 THE first of the many street demonstrations of the Civil Rights movement in Ireland was the August 1968 march from Coalisland to Dungannon in County Tyrone. Arising out of the local experience of sectarian discrimination, the march helped to set in train a series of events that would change Irish politics forever. Nationalists in the Six Counties had begun to explore new ways of highlighting the reality of discrimination. They had looked to Governments in Dublin for decades but found little help there. The IRA’s Resistance Campaign had ended in 1962, having failed heroically against the overwhelming military superiority of the British Army and RUC. However, the imposition of internment without trial, the banning of Sinn Féin and the use of the B Specials as a rural terror force, all exposed the violence that lay beneath the surface of the Orange state. Five years after O’Neill’s accession nothing had changed. Unemployment and emigration among Catholics was far higher than among their Protestant neighbours. In County Tyrone, with a population of just over 73,000 Catholics to 60,500 Protestants, there were only 52 Catholics employed in local government as against 300 Protestants. Such discrimination was highlighted by the Campaign for Social Justice established by Patricia and Conn McCluskey in Dungannon in 1964. Parallel with these developments, the IRA and Sinn Féin were rethinking their strategy with more emphasis to be placed on open campaigning against injustice in the North. The Wolfe Tone Society was established as a forum for debate and to circumvent the Stormont ban on the Republican Clubs, the name which, in turn, had been adopted to evade the ban on Sinn Féin. Members of the Wolfe Tone Society, the Campaign for Social Justice and others were involved in the formation of the Northern Ireland Civil Rights Association (NICRA) in February 1967. It was direct action on the ground that propelled the nascent Civil Rights Movement onto the streets. The Brantry Republican Club in County Tyrone had campaigned for council housing to be built but when 15 houses were built in Caledon only one of them was allocated to a Catholic. The house next door was allocated to a single Protestant woman, the secretary of a unionist politician. Local people decided to protest. The main organiser was Annie Mary (better known as ‘Nana’) Gildernew, grandmother of Sinn Féin's Michelle Gildernew. 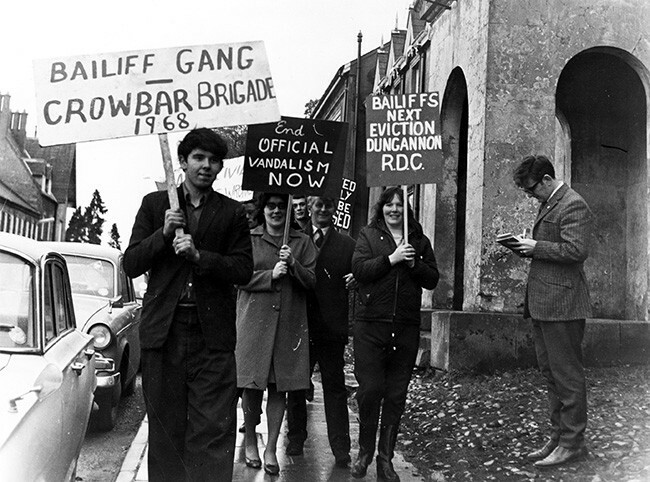 Over a period of several months in 1967/68 a local family and supporters occupied a house in the Caledon estate. When they were evicted the case was raised in Stormont and began to make headlines beyond Tyrone. This was the spur for the march from Coalisland to Dungannon which received the endorsement of NICRA. In a pattern that was to become all too familiar in the months ahead, Ian Paisley organised a counter-demonstration for Market Square in Dungannon. This was then used as a pretext by the RUC to ban the NICRA parade from the Square. About 2,500 took part in the NICRA march from Coalisland to Dungannon. The march was stopped short of Market Square by an RUC cordon. The main speaker was Austin Currie MP, later a Fine Gael TD. Also speaking was Gerry Fitt, West Belfast MP. Fitt who, years later, was lifted into the House of Lords by Margaret Thatcher, declared that they would go on until they had “Civil Rights and a 32-County Republic”. But the real leaders of the Civil Rights Movement which began that day were the rank and file, the ordinary people of Tyrone and beyond who marched for justice and freedom. 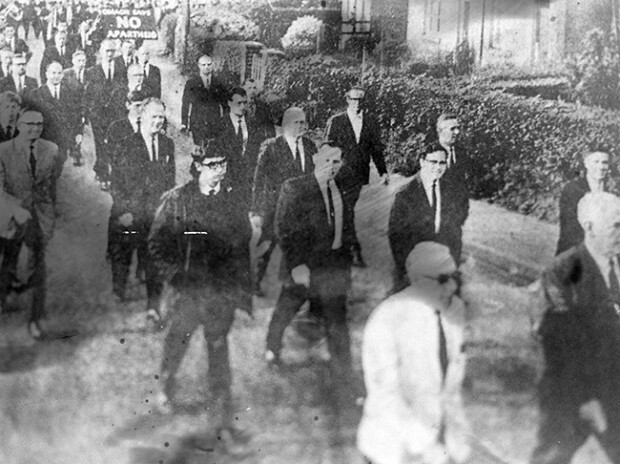 The first Civil Rights march from Coalisland to Dungannon was held on 24 August 1968, 50 years ago this week.